Dave Musser grew up pickling and is now passing on the knowledge to his own kids. Pickling parties are a family event at the Musser house. Sometimes there's a gaggle of friends and relatives; other times it's Dave Musser, his wife Brianna and their feisty 3-year-old daughter picking the bounty from their garden. Then the adults wash the equipment, boil the vinegar-based brine, pack, seal and then boil the jars. 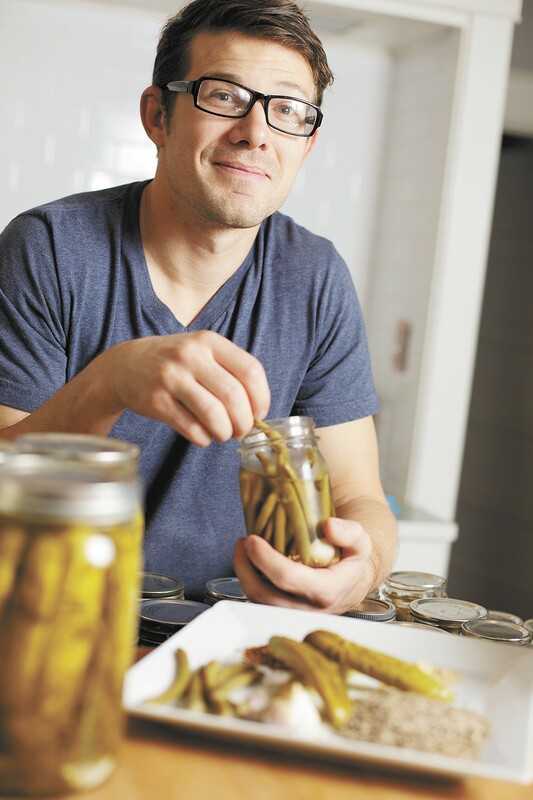 Musser, who grew up pickling with his parents, preserved cucumbers and spicy green beans with his own young family for the first time last year. They now have a closet full of homemade pickles and canned pear butter, spaghetti sauce and salsa. "I was always the weird kid who brought homemade pickles to school in my lunchbox," the 32-year-old says in his Emerson-Garfield neighborhood home. "Now I'm passing down this tradition." Pickling, canning and brewing beer at home are making a comeback. What once was something older generations had to do to make budgets and food supplies last is now trendy, as Portlandia-watching young people look to be healthier and self-sufficient. But Musser says he didn't get into preserving because it was hip. 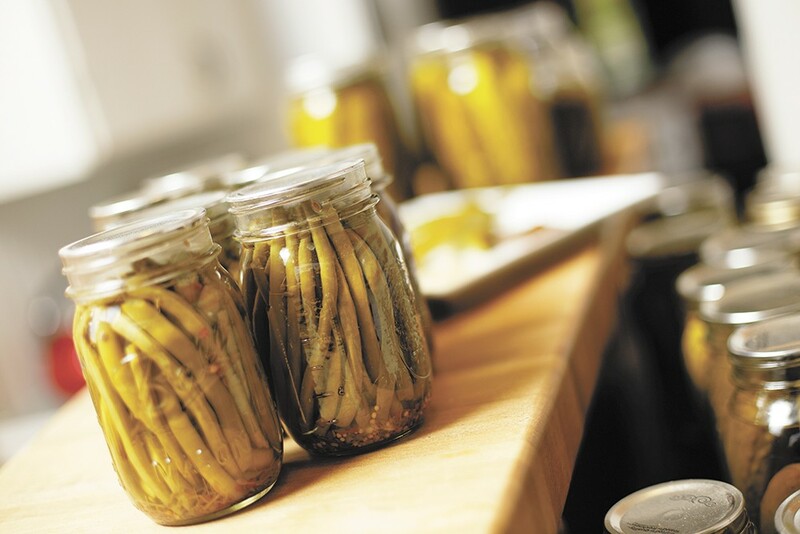 Dave Musser's pickled green beans, just one of the vegetables he pickles. "There's probably a little bit of cool pride in me to say 'I made this, I grew this,'' says Musser, a pastor at Alter Church. "It's fun to say to our daughter, 'This is out of our garden and you helped with this.' She's more likely to eat it that way." Not only do the Mussers' dill pickles turn out light and crunchy, the packed jars make perfect housewarming gifts. Big dinners also become a bit simpler. "When people come over, all I have to do for an appetizer is put out a plate of pickles, crackers and cheese, and people are happy," Musser says. At Spokane's Petunias Marketplace, owner Stacy Blowers sells a variety of pickled vegetables packaged in her quaint shop's commercial kitchen. She says over the past four years, customers' interest in pickling has spiked. "Across the board, people are interested in the farm-to-table process again because it's healthy and wholesome," Blowers says. Manufacturing and selling pickles for the public is quite a different matter than making them at home. The FDA must approve all pickle recipes before they can be sold at a shop or local farmers market. "It's important I know what I'm doing with my process, recording every step of the way," Blowers says. "There is a big risk with pickles, but if you do it appropriately, in a consistent manner, it will work fine." That risk is botulism, a potentially fatal form of food poisoning that paralyzes the body. The best way to prevent the bacteria from activating is heat and a tight seal. If a jar of pickles has a popped lid, murky color or funky odor, toss it out. With winter fast approaching, the Mussers' garden is dormant until next spring, but that doesn't mean they can't pickle at any time. Beets, a cold weather crop, can be pickled until the frost hits. As Musser points out, you can pickle store-bought pickles year-round or purchase from seasonal farmers markets if you don't want to tend a garden. Musser's neighbor James Toshack, 32, also pickles. He's been at it for about five years, after an overabundance of vegetables from his family's garden led to some experimentation. He especially likes concocting relishes and sauerkraut. "I find the whole process incredibly rewarding. I don't mind sweating a bit," Toshack says. But the process can be daunting. Pickling can take up an entire afternoon and can grow monotonous.